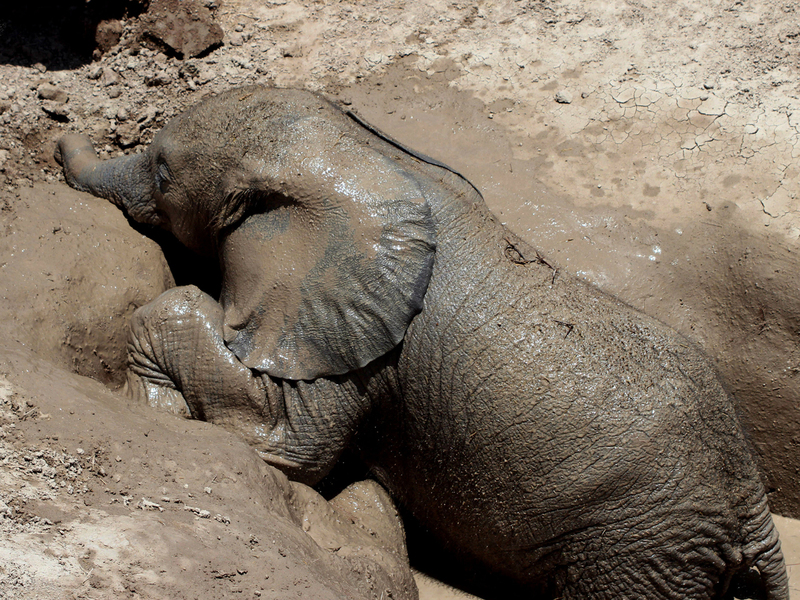 NAIROBI, Kenya How do you pull a baby elephant out of a deep, muddy hole? A rope and a Land Rover. Then the payoff: A frantic baby elephant sprint to mom. A heartwarming video of the rescue of a baby elephant in a Kenyan national park that lies in the shadow of Mount Kilimanjaro gained a mass of viewers on Thursday. The video shows the rescuers' potentially dangerous faceoff with the mother elephant and their struggle to get her calf out of a 5-foot hole. Vicki Fishlock of the Amboseli Trust for Elephants faced down the mother with her Land Rover and made a high-pitched aye-aye-aye call to help drive the mother off. Thirty muddy minutes later, after two men struggled to get a rope around the 8-month-old calf, Fishlock put her SUV in reverse and pulled the animal out. "Relief! Rescues where family members are around are stressful, and I'm always happy when everyone is safely back in the cars. And I have to admit that the reunions always bring a tear to my eye. The intensity of their affection for each other is one of the things that makes elephants so special," Fishlock said. The hole was a man-made well with a foot of water in it was dug by the Masai tribesmen who live around Amboseli National Park, and the trapped elephant underscored the increasing problem of human-animal conflict. The baby elephant was too small to crawl out on its own and would have died without the help of rescuers. If the elephant dies, it ruins the well, angering the Masai who live nearby. The rescue took place on Oct. 8. The very next day, another elephant calf fell in the same well. That baby's family was driven off by the Masai, so when the Amboseli Trust for Elephants rescued the second calf, it sent the baby to an elephant orphanage in Nairobi, The David Sheldrick Wildlife Trust. The video of the rescue was posted on YouTube last week but on the website LiveLeak on Thursday. Elephants across Africa are fighting for survival as expanding human settlements increase the number of human-animal conflicts. Worse, elephants are being slaughtered by the thousands for their ivory tusks, which are shipped to Asia, particularly China, to satisfy a demand for ivory trinkets. The Amboseli Trust for Elephants has been studying elephant families since 1972, and Fishlock immediately recognized the mother in the Oct. 8 well incident -- Zombe -- from a mark near her ear. Zombe appeared to almost sit on Fishlock's Land Rover as the vehicles tried to push the mother away from her trapped baby. Despite the confrontation at the beginning of the rescue, Fishlock thinks Zombe understood in the end that humans were only trying to help. "After the video we cut the engines. She didn't charge us, she didn't run away. Eventually after five minutes they just walked out. I think she did understand," Fishlock said. "I certainly felt like she had forgiven us for our very impolite behavior."